That single awareness day... People at several places were happily posting their pictures commemorating St. Valentine's day. I was happily gonna join in the fun too, but by the time I took mine it wasn't the 14th is some places. I also tend to get discouraged when everyone does the same thing at once. 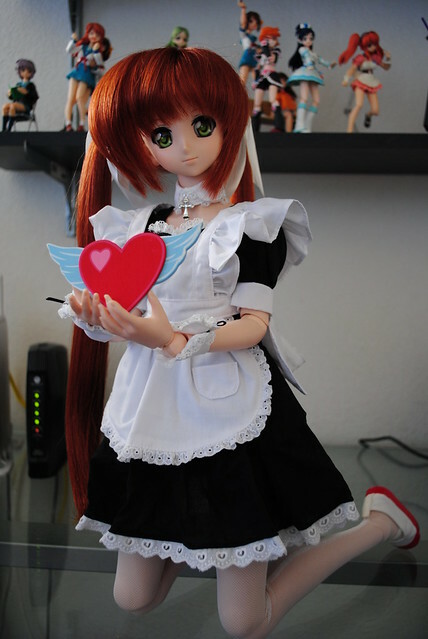 That heart Nanoha is holding reminds me of this song with the wings it has, "Flyin' to Your Heart" from the awesome rhythm game that is Gitaroo Man. Something much more memorable happened last week though. I bought a couple of Nintendo DS games, games that I wanted to get for a while. When I stumbled by chance when they were on sale for $15 each I picked them off without a second thought. In case you are wondering the two games were The Legend of Starfy and Shin Megami Tensei Strange Journey. What's memorable about that you might ask? 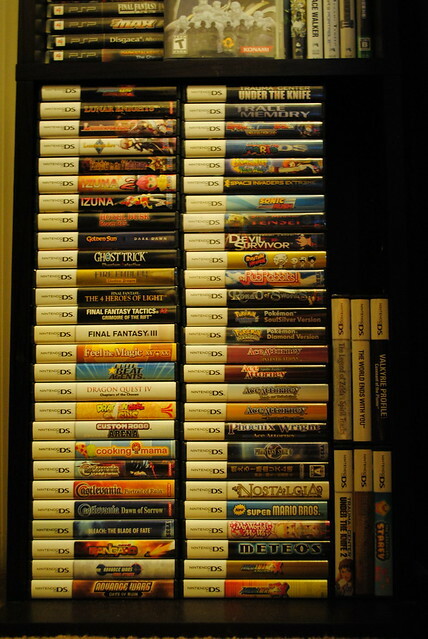 If you take a look at that badly white balanced picture of my shelf you might notice those stacks of DS games. With my new acquisitions I now own 60 games for the system. Still falling a bit short of my PS2 where I own close to 80 games for the system. Sigh... I should stop adding games to my backlog.